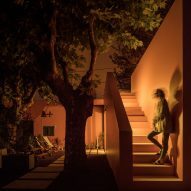 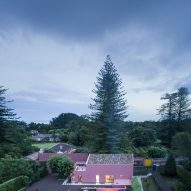 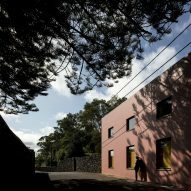 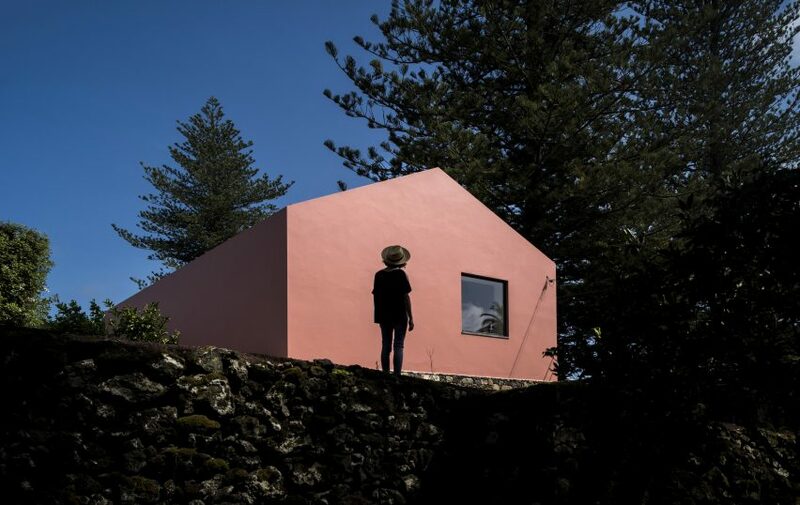 Italian studio Mezzo Atelier chose a vibrant shade of pink for the walls of these guesthouses in the Azores, which are housed inside a converted stable. 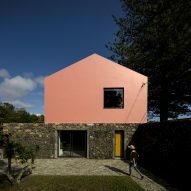 The Pink House is located on the island of São Miguel in the Portuguese archipelago. 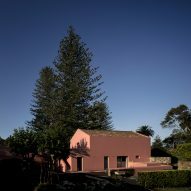 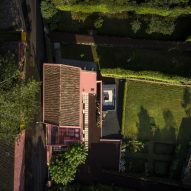 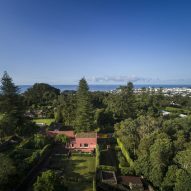 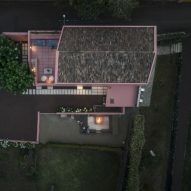 The building was originally constructed in the early 20th century and is tucked away on a side street on the outskirts of the capital, Ponta Delgada. 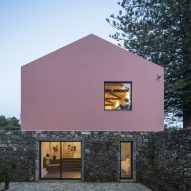 Giacomo Mezzadri and Joana Oliveira of Italian firm Mezzo Atelier were tasked with transforming the old stables into two guesthouses that retain the character of the historic building. 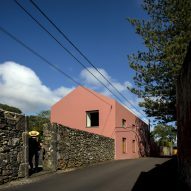 Their response was to make new openings in the walls, and to paint the gabled facades pink to match the hue of other traditional buildings in the area. 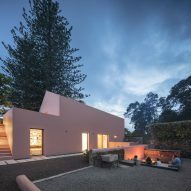 "The design's main goal was to keep the construction's character, lines, and its rural atmosphere, while adapting the enclosed structure to a completely new typology and contemporary regulations," said the architects. 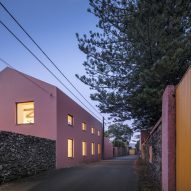 The building had been owned by the same family for six generations, but required a complete overhaul to make it suitable for its new purpose as rentable accommodation. 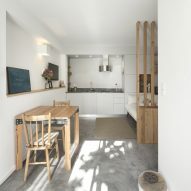 A single-storey extension was added to one end of the gabled building to accommodate a 30-square-metre studio apartment with its own private terrace. 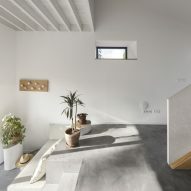 The main house is arranged over two levels, with the ground floor accommodating a pair of bedrooms, and a split-level reception and circulation space that opens onto the adjacent cobbled yard. 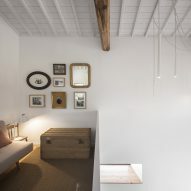 A double-height void containing the staircase allows a view up towards the ceiling and the original timber trusses, which are left exposed to accentuate the impressive height of the space. 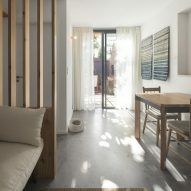 The upper floor contains the social functions in an open-plan room that makes the most of the expansive volume. 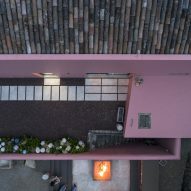 A kitchen at one end opens onto a terrace located above the studio. 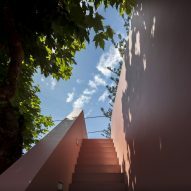 The terrace's concrete slabs were mixed with red pigment from the site. 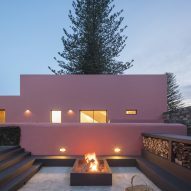 To one side of the building, the foundations of an old greenhouse were transformed into a fire pit surrounded by sunken concrete seating. 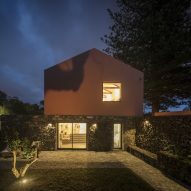 The architects incorporated references to Azorean vernacular architecture throughout the project, including the outdoor staircase leading up to the terrace and the use of whitened wood internally. 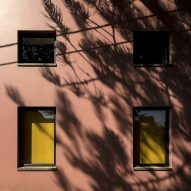 In addition to the pink hue applied to the building's exterior, the use of an ochre tone for the kitchen and surfaces within the bedrooms evokes a shade traditionally applied to door and window frames in the region. 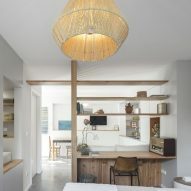 The overall interior scheme is kept simple, with existing features and rustic details complemented by a muted palette of white walls and natural materials. 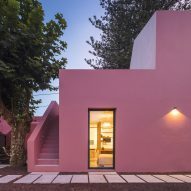 "The interiors and custom-made furniture were carefully designed in order to create a neutral and peaceful atmosphere, allowing the garden views to be prominent on the inside spaces," Mezzo Atelier added. 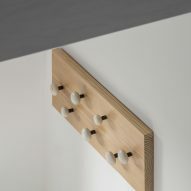 Locally grown Japanese cedar is used for internal joinery, such as the desk and open shelves that create a partition between the bedroom and living areas in the studio apartment. 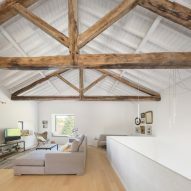 Old wooden beams salvaged from the site were reused by local artisans to construct custom-made tables, which the architects asked to be simplified to ensure they complemented the pared-back interiors.